We’d love your help. 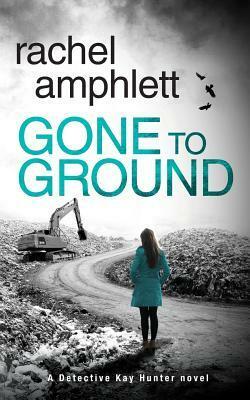 Let us know what’s wrong with this preview of Gone to Ground by Rachel Amphlett. When more body parts start turning up in the Kentish countryside, Kay realises the disturbing truth - a serial killer is at large and must be stopped at all costs. To ask other readers questions about Gone to Ground, please sign up. Frustration mounted quickly as they kept hitting a brick wall – no motive, no evidence, no suspects – they knew they needed to find answers and quickly. The media were hounding them; the public was scared. Would Kay and her team of detectives find the brutal killer before more bodies were found? Or had the killer gone to ground? They needed a break. Gone to Ground is the 6th in the Detective Kay Hunter series by Aussie author Rachel Amphlett and once again it’s an intense, fast-paced, action-paced thriller! I love this series – Kay Hunter is an exceptional character and I can’t wait to read the next one! Highly recommended. Rachel Amphlett has done it again, another solid police procedural in this fantastic crime series. Gone to Ground is perfect for readers who love a strong mystery that’ll keep you guessing until the author decides it’s time to reveal all! Six books in, and it’s mighty impressive that Amphlett still manages to grip me as a reader, and have me hella invested in the plot, and remaining a fan of Kay Hunter and her team. While Gone to Ground can be enjoyed a standalone, I think you’ll get much more o Rachel Amphlett has done it again, another solid police procedural in this fantastic crime series. Gone to Ground is perfect for readers who love a strong mystery that’ll keep you guessing until the author decides it’s time to reveal all! Six books in, and it’s mighty impressive that Amphlett still manages to grip me as a reader, and have me hella invested in the plot, and remaining a fan of Kay Hunter and her team. While Gone to Ground can be enjoyed a standalone, I think you’ll get much more out of it, if you’ve read the books that came before – don’t fret if you’re new to this series, each instalment is brilliant, that’s why this is one of my favourite crime series. If we look a bit closer at the mystery in Gone to Ground, you’ll find it packed with tension, as with most serial killer thrillers, the race is on to catch the killer before more bodies surface. I never like to give anything away in my reviews, so just know this is a well-thought-out mystery that starts with a bike ride and an amputated foot! It’s the perfect read for fans of police procedurals. And you become even more invested because of who is tasked with solving it. I don’t think I will ever tire of Kay Hunter, she’s a fantastic character, likeable and determined. Kay remains one of my favourite fictional detectives and her and her partner, Adam, remain my favourite fiction couple. What makes their relationship so great, and a pleasure to read about, is how supportive they are of each other, it’s rare but their relationship is drama free and that creates this feel-good feeling when reading because you’re genuinely happy for Kay. She’s certainly been through a lot, and all you want is the best for her. In this instalment, Kay has been promoted to Detective Inspector, and trust me, she’s earned it, but what that has done is created an opening for her old role. And that brings a whole new element of tension to this read. The policing team work really well together, and over the course of the series you really get to know them, so you’re worried about a newcomer upsetting the dynamics. What’s also great, is while Kay is rising through the ranks, she is still very much involved in the investigation’s ground work. If you read my reviews for previous books in this series, you’ll find them eerily similar to this one, and that’s because this series is consistently good. It brings a fresh new mystery to solve with each book, with the added pleasure of returning characters that you’ve grown fond of. Amphlett really has penned a great series, and created a remarkable protagonist in Kay Hunter. Each book is this series makes for addictive reading and Gone to Ground is a fantastic instalment! I cannot wait for book 7! The scene is set from the very first page, when a Sunday morn Kay Hunter is back! Yes, she is! And I couldn’t be more excited if I tried! Gone to Ground opens with a leisurely Sunday bike ride that quickly morphs into a terrifying experience for a group of friends when they discover a severed foot, still housed in its original boot. Kay and the team are called to investigate the grisly find but struggle to discover the victim's identity. The Home Office Pathologist is the first person to shed any light on who the victim may be and from there on, Kay and her devoted team slowly and methodically work with the evidence they have to a Gone to Ground opens with a leisurely Sunday bike ride that quickly morphs into a terrifying experience for a group of friends when they discover a severed foot, still housed in its original boot. Kay and the team are called to investigate the grisly find but struggle to discover the victim's identity. The Home Office Pathologist is the first person to shed any light on who the victim may be and from there on, Kay and her devoted team slowly and methodically work with the evidence they have to attempt to solve a difficult case. The teams floundering in the first half of the book shows the frustrations of everyday police work and the minutiae they are required to sift through. Add to this Kay's recent promotion to Detective Inspector, her despair at the mounting paperwork her new role entails and the thankless task of interviewing and finding a new Detective Sargeant for her close-knit team. I have to admit, the thought of a new character joining the team made me feel a little uneasy but I'm sure I'll get used to the new arrangements soon enough. One of the things I love about the Kay Hunter series is Adam, Kay's (dishy) other half. Adam is a veterinarian and regularly brings home a patient from the practice. Often Kay has stumbled home after an exhausting day protecting the folk of Kent to be met by some odd creature snuggled up on her kitchen floor! I love these small, often furry additions to the storyline as they add a touch of humour and as a regular reader of the series, I am always looking forward to finding out who will be arriving next. Adam also adds to the story as he grounds Kay and allows the reader to see Kay the person, not Kay the copper. A perfect pairing. Would I recommend this book? Absolutely. This is my favourite in the series, so far. The plot had me gripped from start to finish and I struggled to put the book down. I have a bit of a thing for serial killer thrillers so Gone to Ground ticked all the boxes for me. It's a little grisly in places but I LOVE THAT and you shouldn't let that put you off (it's really not that bad, I've read more gruesome books!). Gone to Ground works perfectly well as a standalone as it feels as though this is a new dawn for Kay and the team. Saying that, why would you want to miss out on the proceeding five books when they're brilliant and well worth a read! Absolutely compulsive reading from an author who gets better and better with each book. Roll on book seven because I can't flipping wait! In this instalment of a series that goes from strength to strength a bunch of weekend cyclists make the gruesome discovery of a severed foot. Hunter and her team are on the job, trying to find the rest of the body and identify the victim. Before long, more body parts show up. It looks like they have a serial killer on their hands. This was a good police procedural but I didn’t enjoy it as much as previous books in the series. "She had tried to push the memory away over the years, heeding the advice of the psychologists her parents had consulted, but she would never forget the stench of burning human flesh." I have been mentioning this series a lot during the last couple of months, and Detective Kay Hunter has quickly grown into a new favorite of mine. I have been mentioning this series a lot during the last couple of months, and Detective Kay Hunter has quickly grown into a new favorite of mine. I'm still kicking myself for not starting this series sooner, but at least I have another new favorite discovery to add to my list of 2018 top reads... Gone To Ground is already book number six in the series, and once again an excellent read. This series hasn't disappointed me yet! I always look forward spending more time with Kay Hunter, and time always flies as soon as I start reading the first page. I literally flew through Gone To Ground and finished it in less than a day. I really like the new dynamics between Hunter and her team and reading about them is like returning to an old friend. The writing is sold, engaging and the plot twists are very well executed. I had no idea who was behind it all until the very end! And I do love my surprises. This investigation starts out a little slower than usual, as there are a lot of unknowns, but it leaves us with more time to spend with our favorite main characters instead. It was interesting to see how things slowly started to fit together and boy, what an ending! Disturbing, shocking and chilled me to the bone... Gone To Ground is without doubt another excellent to this series. I can highly recommend all six books to any detective thriller fan. When a discarded body part is found by a couple of cyclers, DI Kay Hunter and her team have no idea about the who, how and why. It's hard to identify the victim based on the little evidence they have, but as more body parts start showing up, they are slowly starting to piece things together. Kay realises they have another serial killer on the loose, and they will have to step up their game before he kills again. Rachel Amphlett is one of the best things that has happened in my life. I thank all the stars in the whole universe for making our paths cross. I would have missed on such great books if I haven’t met Rachel. All of Rachel’s books are addictive reads and Gone to Ground is no less. From the first chapter, we dive straight into action. I love how Rachel casually builds up the tension and BOOM! she drops a bomb. And, funny enough, I find myself waiting for that particular moment. Rachel has this amazing skill of delaying the pleasure of discovery with a bit of extra detail or backstory – which sometimes made my brain shout – Come on! Just tell me what the woman saw! – and I absolutely loved it! I felt pity for the witnesses who found the said severed pieces. The description even made me gulping down my bile. As I would read their part I would say to myself – Oh! You don’t know what Rachel has in store for you. I loved how the writing flowed in this book. For some reason I felt it was more polished and fine-tuned than the other books, placing it a step ahead. There is a balance in the narrative, with subtle comic reliefs sprinkled throughout the book, making it easy for me to continue reading. It gave much needed breaks to the characters and me as a reader. The characters! I don’t know what to say about them. I love them all! The series should be called ‘Kay Hunter and Co. series’ because that’s how it feels! They all are in this together, through thick and thin. I love the interaction and banter they share, makes me feels that I’m there too! That’s a major plus point to Rachel. You’ll realise this if you read the series in order, the characters are growing and evolving with each new addition to the series. They don’t feel stagnant and with every book you get see a new side to them. Also, plus one more point to Rachel for letting Adam bring in a miniature goat this time. And I think I might be developing a crush on Ian Barnes. The plot just kept me on the hooks! I simply couldn’t guess who the serial killer was and what was the motive. It was only when Rachel decided to let the readers know that’s when I actually connected the dots. I loved how Kay and Co kept hitting dead-ends but still strove through and saw that they catch the killer. I have to say. With every new addition to this series, I feel a bit anxious. What if I don’t like this book? What if it doesn’t create the impact on me as its predecessors have? Now that I have read the sixth book in the series, I can say that I am not disappointed at all! I don’t know how Rachel does this, but she does it again. On that note, I just realised that she has just entered my list of authors who never disappoint me and let me tell you – there are some big names there. You might have heard this name in my posts – Agatha Christie – heard of it? Yup! Once again, Rachel Amphlett has delivered a terrific British police procedural and visiting again with Detective Inspector Kay Hunter and the people she cares about was well worth the wait for this episode. Dead bodies are never pleasant to see, of course, but the level of brutality in first one killing and then more is beyond what some of Kay’s homicide team have ever seen. There’s no question they’re dealing with a serial killer but this kind of violence usually means there’s something personal Once again, Rachel Amphlett has delivered a terrific British police procedural and visiting again with Detective Inspector Kay Hunter and the people she cares about was well worth the wait for this episode. Dead bodies are never pleasant to see, of course, but the level of brutality in first one killing and then more is beyond what some of Kay’s homicide team have ever seen. There’s no question they’re dealing with a serial killer but this kind of violence usually means there’s something personal going on and, yet, these victims seem to have no connections with each other. Each facet of the investigation leads to more questions and, if there’s any common thread, it may be a resort hotel that specializes in business team-building activities. Still, Kay and her colleagues are on a rollercoaster and the last nugget of information is a stomach-churning bombshell. On the personal front, Kay’s veterinarian husband, Adam, who brings patients home frequently, is now tending a sweet little goat who has all the annoying habits of, well, a goat, but Kay still prefers her over the snake Adam brought home one time. It’s also nice to see Kay and Adam socializing with her colleagues and doing their best not to talk shop if only for an hour or two. Barnes, in particular, becomes more fleshed out in this book and I like him even more than I already did while criminalist Harriet is becoming more and more vivid in my mind. Alison Campbell has become one of those narrators who, in my opinion, live and breathe the main character and she quite simply nails not only Kay’s persona but also does a wonderful job with the other characters. It’s not easy for a narrator to do opposite gender voices but Ms. Campbell does men really well and all her voices are distinct from one another. One of the highlights of my reading year is a new Kay Hunter book being published and having been a fan from the start I couldn’t wait to get started on Gone to Ground (Kay Hunter 6). The story opens in an innocuous manner with a leisurely cycle ride amongst a group of friends. The tone soon changes when one of the group find an abondoned boot….with a foot still in it! Thus begins a new case for Kay Hunter and her team. I have loved seeing this team grow closer as the series has progressed and o One of the highlights of my reading year is a new Kay Hunter book being published and having been a fan from the start I couldn’t wait to get started on Gone to Ground (Kay Hunter 6). The story opens in an innocuous manner with a leisurely cycle ride amongst a group of friends. The tone soon changes when one of the group find an abondoned boot….with a foot still in it! Thus begins a new case for Kay Hunter and her team. I have loved seeing this team grow closer as the series has progressed and once again they prove to be a well oiled machine of investigative work. Each knows their role and gets on with it and Kay is confortable to let them do so. What a brilliantly light-hearted last couple of pages to what is a horrifying serial killer thriller! An awesome addition to the excellent Detective Kay Hunter series. If you haven't read this series as yet then I highly recommend that you do. You don't know what you're missing out on. Gone To Ground is the sixth book in the Kay Hunter series and they just get better. I have thoroughly enjoyed it! I warmed to Kay and her team from book one, but they have really grown on me over the series. They a What a brilliantly light-hearted last couple of pages to what is a horrifying serial killer thriller! An awesome addition to the excellent Detective Kay Hunter series. If you haven't read this series as yet then I highly recommend that you do. You don't know what you're missing out on. In this book Kay and her team find themselves investigating the discovery of a severed foot. This gruesome discovery leads them to a victim who has been cut in to pieces and it isn't long before they realise they have a serial killer on their hands. But what connects these victims and what possible motive could someone have to commit such horrific crimes? This is a compelling murder mystery, full of suspense, twists and turns. The story flows perfectly and as a reader I felt every frustration as well as the delight of every positive lead as the investigation progresses. Brilliantly written! If you like a good crime thriller you will love it. I love Rachel Amphlett's writing style. Short chapters add to the tension and the fast-paced storyline. A true example of a gripping page-turner. I LOVED it and I highly recommend. I have enjoyed ALL the Kay Hunter books, this one is no exception. It is the first story with Kay in her new role as Inspector. A tense and gripping murder mystery. Once again I not only enjoyed the tension but also the inter play with her work colleagues and of course her personal home life with Adam. It makes these stories human and realistic. All books by this author I read so far where great, 4 or 5 star reads for me, so I am looking forward to it, and will pr From the mailing list of the author I received an email that this is to be published July 8th, 2018 and a few retailers allowed pre-ordering it today (June 10th, 2018), ebook.de (in Germany) among them. Amazon will surely follow soon. Gone to Ground is the sixth and the best of the Detective Kay Hunter series yet. Take your Dramamine because if you are prone to motion sickness, the twists and turns on this baby will put you right over the edge. As is the case with nearly all the Detective Kay Hunter series books, Gone to Ground grips the reader from the start. What makes this installment (and others) interesting is how it starts with one thing (and ICK. What a thing. ), and despite the absence of logical explanation, leads, or Gone to Ground is the sixth and the best of the Detective Kay Hunter series yet. Take your Dramamine because if you are prone to motion sickness, the twists and turns on this baby will put you right over the edge. As is the case with nearly all the Detective Kay Hunter series books, Gone to Ground grips the reader from the start. What makes this installment (and others) interesting is how it starts with one thing (and ICK. What a thing. ), and despite the absence of logical explanation, leads, or suspects, an intricate story begins to unravel. In Gone to Ground, readers see the very human side of Kay and her team and that they all, like all of us, are just trying to find balance. Kay’s home life with her veterinary husband Adam is a welcome reprieve and place of comfort for readers when the body count and gruesomeness factors of the case are intense. Adam’s rotation of animals and the unexpectedness of their behaviors as he brings them home provides small doses of humor and makes readers love him and his and Kay’s relationship even more. The same basic cast of characters returns, each unique and uniquely flawed, but author Rachel Amphlett is letting readers better know them. Barnes particularly has more personality and depth than ever, and his humorous, witty asides are a source of amusement. Readers even get a glimpse of a Kay who is distracted from her duties – just temporarily - by a flirtatious hottie, which makes her feel more real. I am becoming more attached to these characters with every installment in this series. Now, about those twists and turns… Amphlett was KILLING me with her super obvious hints at the beginning and let me feel all superior because I had so clearly figured it out, case closed. Next, she convinced me that I was so smart to have caught the hints and figured it out and then showed me that I was wrong, and then I was right – almost. Not really. Head spinning? Ignore her hints and carrots: SHE WILL MISLEAD YOU!! There are not only twists, but it gets pretty twisted when all is finally revealed. There have been some dark storylines in the series so far, and Gone to Ground's is no different. It explores what the disturbed mind can do and how evil deeds can be rationalized. The unsettling reminder of “they walk among us” gives the book a creeper factor, multiplied by ten. As always, I love the oh-so-Britishness to these stories. From the delightful accent of narrator Alison Campbell (Nailed it. Again. Some more.) to the never-ending, steaming mugs of coffee and tea (oooh, and even a nip from the ol’ bottle here and there), to the solicitors and detectives who are available on a moment’s notice, all hours of the night, Gone to Ground is a perfect British police procedural for readers who are all about solving the crime. ABOUT THE NARRATION: I repeat: Alison Campbell nails it. She is absolutely perfect for this series and is now fully the voice of Kay Hunter. She has picked up her pace just a tad, so I didn’t have to increase the speed, which made her delightfully British accent more delicious. And with the book only six and a half hours long, that is just fine. (Side note: this was the first book I’d listened to via Author’s Direct, and I like that you can control the speed in tenths versus Audible that only allows quarter increments.) She voices the multiple characters so that it seems like there are multiple voice actors, not just one, and male and female voices alike are well-done. Amphlett’s writing with Campbell’s voicing of it is such a great escape for this Texan. Note: Even though this is Book 6 in the series, it works fine as a stand alone. Kay Hunter has her hands full with this one! It all starts with a group of bicyclists and a detached foot. The trail of clues lead to resort hotel that has lots of team building activities like archery, barbecues, and such. So many suspects, so little time before yet another victim turns up dead. First, I have to talk about the goat. Kay’s husband Adam is a vet and he sometimes has to bring home a critter for a little Note: Even though this is Book 6 in the series, it works fine as a stand alone. First, I have to talk about the goat. Kay’s husband Adam is a vet and he sometimes has to bring home a critter for a little TLC. This time, it’s a little goat. Adam thinks he can set up a pen in their back garden for the little devil. Hahahahahahaha! Obviously, Adam has a lot to learn about goats. I found this an adorable touch to what is admittedly a grim story. Back to the grim story. I did find one thing kind of weird. Everyone who comes into contact with a dead body or body parts (except for Kay and her boss) has a strong emotional reaction. The bicyclist who found the foot vomits and cries and has to be seen to. The truck (or was it a tractor?) operator who finds victim #2 is so distraught he gets the rest of the week off. Now these guys don’t know the deceased at all, so I thought it was a little odd to have the same emotional reaction from two guys. Later on, two of the junior detectives also have a strong reaction but they fare better in hiding it. I expected a greater variety in reactions and not for nearly everyone to be upset over it. Other than that, this was an intriguing murder mystery. I loved the tangled web at the resort. Since there’s all these capable people hired by the resort to provide activities for the guests, there’s plenty of surprises to uncover. I enjoyed the little snippets about the various arts and crafts. This is Kay’s first big investigation where she’s leading things and her boss is right there offering a helping hand (because he’s a good guy). Her team is also well oiled, each one knowing how the other operates. They’ve been having their own unofficial team building dinners once a month and it shows! I love that there’s no in fighting or sneaky, petty behavior. Perhaps half way through the book, they figure out how the killer is disposing of the bodies (mostly) but they still don’t have a motive or a list of solid suspects. It’s a pretty gruesome disposal method but I personally think the worst is left to be revealed at the end of the book. The tension is a slow, delicious build for this mystery. Kay’s team has to work hard for each little crumb of a clue. Once they figure out the motive, the who is pretty easy to figure out. Then it’s just hunting the killer down before the body count grows again. This was an intense ending to the book and not everything turns up roses for everyone. Another great addition to the series! 4.75/5 stars. The Narration: Alison Campbell continues to be a great Kay Hunter. I also like her supportive, sometimes teasing voice for Adam. She makes a great Kariss (one of the junior detectives) as well. Sometimes her male voices drifted into feminine tones especially if the male character was speaking gently or quietly. But much of the time, the male voices were masculine. Each character voice was distinct. The pacing was perfect and there were no technical issues with the recording. 4.5/5 stars. I can't remember how I first came across this series, but I am so pleased that I did and have been on the journey with Kay Hunter and her team right from book 1, Scared to Death. Kay Hunter is still Detective Inspector since her promotion but still appreciates her roots and works close with the team, refusing to use the office that is now hers, preferring to instead sit with the team and right in the middle of the action. Gone to Ground can be read as a standalone following the wrapping up of ev I can't remember how I first came across this series, but I am so pleased that I did and have been on the journey with Kay Hunter and her team right from book 1, Scared to Death. Kay Hunter is still Detective Inspector since her promotion but still appreciates her roots and works close with the team, refusing to use the office that is now hers, preferring to instead sit with the team and right in the middle of the action. Gone to Ground can be read as a standalone following the wrapping up of events in Call to Arms but this series is most definitely best read in order from the start to understand what the team have been through in the past. An early Sunday morning cycle ride doesn't go quite according in plan, when on a toilet stop in a lay by on the side of the road, a cyclist finds a severed foot! However, that is all that Kay and the team have to go on - there are no clues as to who it belongs to or how it ended up there in the first place. When further bloody parts turn up in other places, rather than helping the investigation, it hinders it further as the additional parts just bring up more questions than answers. What does come out of the gruesome findings is that they are possibly dealing with a serial killer however Kay's gut is telling her that they have not finished and more body parts will turn up. Alongside the investigation, Kay is also having to recruit for a new member of the team to replace the gap she has left following the promotion. None of the team feel ready to take the step up therefore Kay is facing the prospect of bringing someone new into the fold and is concerned about how this will affect the team dynamic. I enjoyed this side of the story to show that business as usual that Kay will have to also deal with now that she is the DI alongside any investigations they have going on. It also shows what a cohesive team that they are and its important to find the right person to join. What I love about this series, is the stable life that Kay has outside of work and the fact that Adam is featured as a key character in the narratives. I'm always intrigued into which waif and stray he's going to bring back next (he's a vet and often brings his work home with him!) - he excels himself this time! I really love how grounded and supportive Adam is to Kay and her career. DI Hunter has her plate full with handling interviews for the Detective Sergeant position that they desperately n The heat is on Detective Inspector Kay Hunter and her team to find another killer on the loose! What level would you go to find the truth when it seems like no one can be trusted? All suspects are leading back to ground zero. Amphlett captivates her readers with this mystery; this time it is a slew of men disappearing around town and turning up with severed body parts and burnt flesh. Kay Hunter and her team are back on another roller coaster mystery. This time they are investigating who could be this murderer who is leaving body parts behind, who are the victims, and why the killer decided to hunt specifically these people. Reading another Detective Kay Hunter book is like returning to visit old friends. The characters are very well depicted, and they have become almost part of the family. This time there are no gripping subplots like in previous books, but Kay and her partne Kay Hunter and her team are back on another roller coaster mystery. This time they are investigating who could be this murderer who is leaving body parts behind, who are the victims, and why the killer decided to hunt specifically these people. Reading another Detective Kay Hunter book is like returning to visit old friends. The characters are very well depicted, and they have become almost part of the family. This time there are no gripping subplots like in previous books, but Kay and her partner can't always be in dire danger. There was a secondary story that added interest to the book but did not contribute to the tension. The book is very well written, like the previous ones, and I was able to picture in my mind everything that happened. The descriptions were well done, and the secondary characters felt like real people. I listened to the whole book almost in one go, and it kept my attention from beginning to end. The story is well paced and the intrigue is well built, keeping the reader always wondering who could be the killer. This series is a quite neat one, with solid characters and intriguing stories. It's also well written, but I have to say that the word 'negotiating' was used four times to refer to driving on a difficult road, and the third and fourth time made me cringe a little. Alison Campbell was simply amazing, but that wasn't a surprise, since her previous work at the other books in the series is excellent. Her compelling narration kept me on the edge of my seat, and her voice range and interpretation skills are top notch, creating the sensation of having a full cast of real characters. She also has the ability to bring the characters to life in a way that it makes you feel that you're watching a movie. Rachel Amphlett and Alison Campbel are a winning team, and they can take my money on whatever book they will produce. For some reason there was a really long pause between chapters. I think I checked every single time that it had paused or to see if there was a problem with the audio. There never was, obviously, but the pause was a bit too long for my liking. It had me questioning my sanity over and over again! Otherwise, I love this narrator. Alison Campbell has a fantastic accent, to this American anyway. I have a thing for British narrators. As for the story itself, it’s just what I’ve come to expect from Rachel Amphlett. I enjoyed seeing everyone starting a new kind of normal. It’s hard to adapt to changes and they seem to be doing it well. Kay Hunter is a solid cop so I was surprised that she’s doing perfectly well in her new position of Detective Inspector. Gone to the Ground isn’t as packed with action and thrilling suspense as a few of the previous books have been. However, this is a step-by-step puzzle and I was fascinated watching them put it all together. I really think the only thing I can complain about is I do love the side stories with her partner, Adam, and the amusing animals he brings home to heal. Can’t you just imagine him as a boy? All the pets his parents had to turn away! I would love to see them finally get that family they so badly wanted. We didn’t hear any of that talk at all this book. Granted, this is definitely a book that is focused on the crime procedural story than that of their private lives. I just like the entertaining that I get from them. Either way, this is a fabulous series and I can’t wait to see where DI Kay Hunter leads us next! I didn't think it was possible, but this series just gets better and better! DI Kay Hunter once again finds herself in charge of a murder investigation; this time, however, she has extra management duties to deal with as well as the day-to-day routine of leading her team to solve a crime with all due haste. With all possible leads going nowhere, they all have to dig in and give a bit more than their all - not easy given the gruesome nature of this case. It is no secret that I'm a big fan of this s I didn't think it was possible, but this series just gets better and better! It is no secret that I'm a big fan of this series. Whilst each book is a stand-alone read, I feel that now, by the sixth book, I have really got to know the investigating team quite intimately. They each have individual strengths and weaknesses which, as a good boss, Kay is fully aware of. They work together as a team, each holding their own and deeply feeling the progress - or the lack of it - as the days get swallowed up. This is an extremely well thought out plot. Several twists and turns make this novel an exciting read and just when you think you understand what's going on it suddenly strikes you that you really don't have a clue! A fantastic thriller, consistently presenting the police team as the humans they are and the ending is, as always, just perfect! Kay has been promoted to Detective Inspector, so in addition to her previous duties she gets to field calls from the curious media and hire her replacement. A severed foot is found, and the team tries to find the rest of the victim. Just when they think they've got a lead, it turns into additional victims. If you're looking for an action packed, guns blazing book...better look elsewhere. If you're looking for a solid police procedural, look no further. I've enjoyed all six books in the series, a Kay has been promoted to Detective Inspector, so in addition to her previous duties she gets to field calls from the curious media and hire her replacement. A severed foot is found, and the team tries to find the rest of the victim. Just when they think they've got a lead, it turns into additional victims. If you're looking for an action packed, guns blazing book...better look elsewhere. If you're looking for a solid police procedural, look no further. I've enjoyed all six books in the series, and I hope there's more to come. Kay is a good leader: she's not completely unemotional, but she's not impulsive or quick to temper. There are moments of dark humor, and they're needed with such gruesome discoveries. Kay's domestic partner Adam is (as usual) good for some levity, this time in the form of a baby goat with a voracious appetite. I'm left with a question: Have we seen the last of Larch? I know he and Kay had a moment of civility in the last book, but after his intense hatred that seemed to be focused entirely on Kay, it feels like a bit of a letdown if we've seen the end of him. I think I need more closure! One of my favorite aspects of Amphlett’s stories is finding out what animal Adam (Kay’s SO) has brought home. As a vet he tre I L-O-V-E the Detective Kay Hunter series from Rachal Amphlett! Each one is a bloody brilliant, edge of your seat, white knuckle read. I have to say Gone to Ground was far more sinister than previous Kay Hunter stories but that just made me relish it more. Filled with twists and turns I am in shock at “who done it.” As always Amphlett delivers a well-executed police drama. With a lack of evidence, it’s a difficult and slow investigation for newly promoted Kay and her close You’re always guaranteed something intriguing, original and a little bit different when Kay Hunter investigates a murder. This is the 6th entry into Rachel Amphlett's Kay Hunter series. If you enjoy a good police procedural these books are for you! Human remains are discovered in a waste disposal plant and it is up to Kay and her team to find out who the victim was and who killed him. The story moves quickly and more bodies are found. The team works on the investigation establishing suspects and then are forced to discard them. Just when I thought I had things figured out Ms. Amphlett threw in a twist and changed d This is the 6th entry into Rachel Amphlett's Kay Hunter series. If you enjoy a good police procedural these books are for you! Human remains are discovered in a waste disposal plant and it is up to Kay and her team to find out who the victim was and who killed him. The story moves quickly and more bodies are found. The team works on the investigation establishing suspects and then are forced to discard them. Just when I thought I had things figured out Ms. Amphlett threw in a twist and changed directions! Another reason I love this series is that Kay is allowed to have a happy home life...with a veterinarian named Adam! Thanks to Adam the books always end on a light note. The subtle humor was great in this one, had me smiling and giggling in a few places. It so sneakily put in that sometimes it catches you a little off guard, and just deflates the boringness to the case, and all the paperwork they have to work through. In a way, it keeps the story lighter, even though it a crime based book. Loved seeing more of Adam, in this one you got to see him outside of the house interacting more with her work colleagues. It was a nice change, also added to the family feeling The subtle humor was great in this one, had me smiling and giggling in a few places. It so sneakily put in that sometimes it catches you a little off guard, and just deflates the boringness to the case, and all the paperwork they have to work through. In a way, it keeps the story lighter, even though it a crime based book. Loved seeing more of Adam, in this one you got to see him outside of the house interacting more with her work colleagues. It was a nice change, also added to the family feeling the Author has been building with the team. You are always left guessing with the Author’s books. You never know who done it before the team does. As they work it out, you also work it out. Kay is settling into a new leadership role, but longs for the action she had as a Detective Sargent (DS). She his been handed a high profile case and instructed to lead the investigation with her old team. That assignment is in addition to her new duties as Detective inspector (DI). While she is juggling these two jobs she is also interviewing candidates to back fill her DS position. As usual there are lots of twists and turns and surprises in this investigation with pressure from the press and positions. All in all a good read. Kay Hunter is back at her best and with a deserved promotion. She provides great encouragement to her team and assists with her usual determination throughout the investigation. It’s a riveting case with an unpredictable conclusion. Another brilliant and clever storyline from Rachel, absolutely love this series. Highly recommended crime thriller novel. I am a big fan of the Kay Hunter series and was very happy when this book came out. It was like welcoming an old friend. I like her character as well as those who surround her, especially the animal humor from her husband, the Vet. These books were meant to be devoured, and I didn't let them down. Page turners for sure. Rachel is a member of International Thriller Writers and the Crime Writers Association, with the Italian foreign rights for her debut novel, White G USA Today bestseller Rachel Amphlett writes crime fiction and spy novels, including the Kay Hunter British detective series, the Dan Taylor espionage novels, the English Spy Mysteries featuring Eva Delacourt, and a number of standalone crime thrillers. Rachel is a member of International Thriller Writers and the Crime Writers Association, with the Italian foreign rights for her debut novel, White Gold, being sold to Fanucci Editore's TIMECrime imprint, and the first four books in the Dan Taylor espionage series contracted to Germany’s Luzifer Verlag.